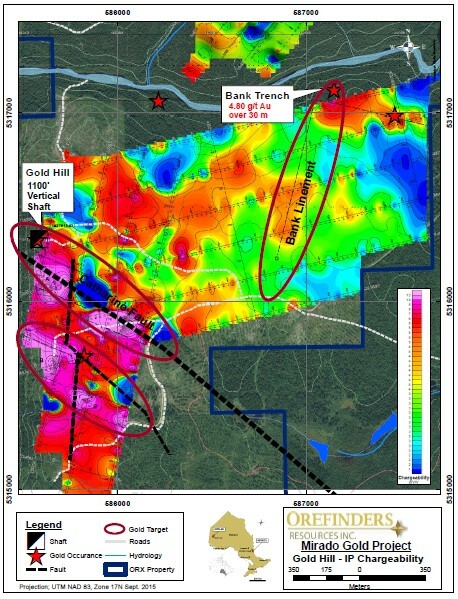 TORONTO, ON--(Marketwired - September 29, 2015) - Orefinders Resources Inc. ("Orefinders" or the "Company") (TSX VENTURE: ORX) is pleased to announce the completion of the Induced Polarization ("IP") ground geophysics survey conducted on the Mirado Gold Project near Kirkland Lake, Ontario. The program targeted two distinct zones on the Mirado Project, the Gold Hill and Catharine Fault Gold Zone, and the Bank Zone along with their projected extensions. See the Mirado Property Map for IP Survey Area. The Gold Hill Zone is a former producing mine with an existing 1100' vertical shaft with eight levels of development and approximately 7500' of drifting during the late 1920's. Historic high grade gold values were reported from underground channel sampling are shown in Table 1 below. The results are considered historical within the NI 43-101 system and the information which Orefinders is quoting from is a Bulk Sampling Programme Carried out on the Gold Hill Property detailed in Magrum's report completed in 1986. The IP around the Gold Hill mine provided encouraging results which highlight the Catharine Fault and a parallel trending fault 300 metres to the southwest. Both of these faults appear to be offset by a post mineralization north-south structure. The robust chargeable anomalies along these faults are significantly wider than the fault zones themselves and correlate with parallel, secondary, features that in the case of Gold Hill are mineralized with pyrite, chalcopyrite and gold. Historic grades from underground sampling returned 2.25 oz/ton over 18.7" along 138' (historical sampling is not NI 43-101 compliant). A follow up mapping and sampling program to map the vein at surface is underway which will be followed up by a trenching program over these sheared quartz veining zones. 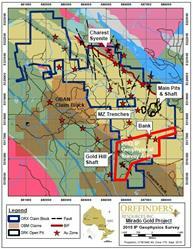 See Gold Hill and Bank Zone IP Results Image. IP line BKL-00, in the NE portion of the grid, identified the extension of the Bank polymetallic sulphide vein approximately 40m south of the Bank trench. 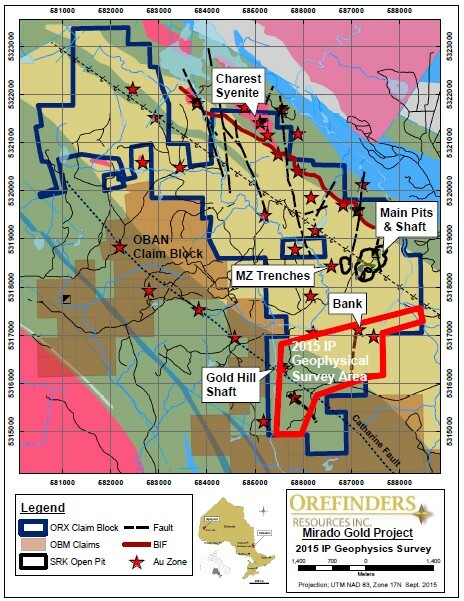 The Bank trench, in 2014, uncovered 30m of a sulphide vein with an average grade of 4.80 g/t Au. The vein is offset by a 6m wide shear that is highly oxidized with several high grade quartz stringers running up to 26.8 g/t Au. The Chargeable anomaly extends ~800m to the SSW along strike of the vein. This is encouraging to see the anomaly continue this far south as overburden thickens to the south. The IP survey also indicates a chargeable feature trending east from the trench which may be the trend of the mineralized shear. The anomaly is at the northernmost extent of the survey grid but would need to be followed up on the ground. For the latest updates please contact or follow us on Twitter @OrefindersR.